A producer of single vineyard wines since 1993. The winery has two winemaking facilities in Glen Ellen, California. The owners are Diane and Henry Mayo, who together planted Chardonnay in the Sonoma Valley in 1990 and released their first 200 cases of wine in 1993. The founder's son, Jeffrey H. Mayo, put the family's winery on a successful path. 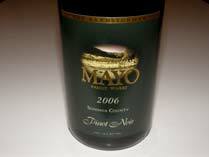 The winemaker, Michel Berthoud, formerly the winemaker at Arrowood Vineyards, joined May Family Winery in 2004. Multiple red and white varietals are produced with an emphasis on Zinfandel. For 2006, a Pinot Noir from La Cruz Vineyard in the Sonoma Coast was released. The Mayo Family Winery Reserve Room offers a seven-course pairing menu that includes seven Mayo Family Reserve wines and seven tasting dishes prepared by Chef Max Porter-Elliott. The Reserve Room is located at 9200 Sonoma Highway, Kenwood, Sonoma Valley, and is open daily (707-833-5504). Tasting is also available at the Mayo Family Winery on Highway 12 and The Cellar Door on the grounds of the Lodge at Sonoma in the town of Sonoma.